Home > METRIC V-BELTS > K Section Metric V Belts for Specialty Machine Tools. K Section Metric V Belts for Specialty Drill Press and Machine Tools. We offer a limited selection online at this time. Please call (317) 519-9020 (M-F, 8AM-4PM EST) or email if you don't see the size you need. Thank you! 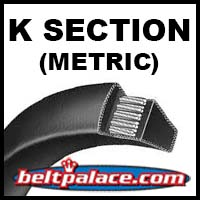 K21 Metric V Belt. K21/K533 Industrial V-Belt. K21 Metric V Belt. BANDO K21/K533 Industrial V-Belt. 5/16” Wide x 21” Effective Length (533mm). Superior replacement for Import brand Metric K21 V-Belts. K22 Metric V Belt. BANDO K22/K559 Industrial V-Belt. K22 Metric V Belt. BANDO K22/K559 Industrial V-Belt. 5/16” Wide x 22” Inside (Effective) Length (559mm). Superior replacement for Import brand Metric K22 V-Belts. K24 V-Belt. Specialty belt for industrial tools. K24 V-Belt. Metric K610 V-belt for industrial tools. K26 Belt. Specialty belt for drill press and industrial tools. K26 Belt. Specialty belt for drill press and industrial tools. Replaces part: V-Belt K660. K27 Metric V Belt. BANDO K27/K686 Industrial V-Belt. K27 Metric V Belt. BANDO K27/K686 Industrial V-Belt. 5/16” Wide x 27” Length (686mm). Superior replacement for Import brand Metric K27 V-Belts. K28 Metric V Belt. IMPORT K28/K711 Industrial V-Belt. K28 Metric V Belt. IMPORT K28/K711 Industrial V-Belt. 5/16” Wide x 28” Outside Length (8mm x 711mm OC). Replacement for Import brand Metric K28 V-Belts. K29 Metric V Belt. BANDO K29/K737 Industrial V-Belt. K29 Metric V Belt. BANDO K29/K737 Industrial V-Belt. 5/16” Wide x 29” EFFECTIVE Length (8mm x 737mm). Superior replacement for Import brand Metric K29 V-Belts. K30 Metric V Belt. BANDO K30/K762 Industrial V-Belt. K30 Metric V Belt. BANDO K30/K762 Industrial V-Belt. 5/16” Wide x 30” EFFECTIVE Length (8mm x 762mm). Superior replacement for Import brand Metric K30 V-Belts. K38 Metric V Belt. Import K38/K965 Industrial V-Belt. K38 Metric V Belt. Import Brand K38/K965 Industrial V-Belt. 5/16” Wide x 38” EFFECTIVE Length (8mm x 965mm). Replacement for Import brand Metric K38 V-Belts.